Since we arrived early evening, we left our stuff at the Coastal Inn (980, good for 5 persons, http://www.dmgte.com/hotel/CoastalInn) after dinner at one of the local grills in the city. After that, we decided to try the popular Sansrival at the café. Perhaps due to the rich American influence, one can notice the remnants of the culture in its architecture as well as food. Contrasting it with Cebu, cuisine here appears to be sweet and fattening! One of our friends, Jiggs joined us for the leg in this tour and the group decided to go to Siquijor which is a few hours ride by boat (http://www.oceanjet.net/dumaguete-siquijor) from Dumaguete. Arriving early afternoon, we had photo ops in popular landmarks such as the church near the port and went to Lazi, Siquijor. Similar to Bohol, the island of Siquijor is a biker’s haven due to the adequately spaced and well paved roads, very minimal traffic and countryside feel-no malls or convenience stores!. Though the general impression is that Siquijor has that supernatural character (probably due to the mythic stories about the island), one can say that travel here makes you close to nature. When we got to Lazi, we had go through uphill climbs and decided to go to the Lazi Beach club for the night. Unfortunately, a large portion of the backroads of this island remain unpaved and I remember having difficulty as terrain was brutally harsh (rolling and unfinished). The Lazi Beach club unlike the other accommodation we’ve encountered before is quite expensive (2500 good for four!) and prices of food and other services seem to be for foreigners (quite expensive)! One consolation though is that the beach view is great and visitors are situated in a more solitary fashion as the resort is one of the few ones there on that part of Siquijor.We got back to Dumaguete early evening and treated ourselves to great food and drink. We were supposed to head north to Bacolod, Negros Occidental but Jun who sustained an injury earlier in his eye needed to get himself checked and sadly was strongly advised to abort the tour. With four of us remaining, Edan and Rahnel decided to pedal from Dumaguete to Bacolod late evening while Jiggs and I took a bus to Kabankalan to continue from there. Arriving early morning at Kabankalan, Jiggs and I pedaled 90km to Bacolod. I remember that the heat was terrible early that day and that prompted us to stop several times to rest and rehydrate. But the road to Bacolod has been memorable as sugar cane plantations are everywhere leaving that sweet, sugary scent as you pass these roads. We arrived a little bit after lunch while Edan and Rahnel got to Bacolod around 10 in the evening. While waiting, Jiggs’ cousin Carla, who resides in Bacolod gave us a gastronomic welcome-treating us to cake, pizza and the popular chicken inasal (roasted chicken). We spent the night at the Regency plaza inn, Bacolod (650 for two persons, one of the cheapest in town and had the basic necessities for the bike tourer! https://www.booking.com/hotel/ph/regency-plaza-tourist-inn.html). before leaving for Iloilo (part of Panay Island, Western Visayas), Carla treated us to Diotay’s eatery. Compared to last night’s food, this time, seafood reigned supreme! After lunch, we took photos taken at the popular Ruins in Talisay City (http://www.choosephilippines.com/go/heritage-sites/2441/love-story-and-ruins/)-which was an old house built by a sugar baron from the city early in the 20th century-dubbed as the Taj Mahal of Negros (10km away from the Regency plaza Inn) , the rich historical tradition in architecture makes this place a must see. We ended the day by proceeding to the port and heading to Panay island. When we got to Iloilo, a member of our bike group, Del Britanico welcomed us and brought us to the popular restaurant Tatoy’s where we had chicken and seafood and went around town and took pictures at the Molo Church and plaza. We stayed at the Highway 21 hotel (1200 good for 4 persons, https://www.facebook.com/highway21hotel/). In these days, Rahnel decided that he will pedal his way up to Caticlan and head to Boracay and proceed to Batangas while the rest decided to stay put and take two ferry trips to Palawan. Rahnel went ahead and Edan, Jiggs and I went around Iloilo to see popular attractions around Iloilo. The next day, we checked out Guimaras Island, which is 15 minutes by boat (25 pesos with bike) from IloIlo. Famous for its beaches and Mangoes, the island is a great place for bikers as it has trails as well as tourist attractions. We went to the windmills and got around the island (about 40km in total) a bit and finally tasted some great delicacies made from Mangoes. We got back again early evening for the next leg of our tour. Around Iloilo city and tasting the ever popular batchoy! Among the different places in the Philippines which was part of the itinerary, I would say that the western Visayas has got to be the most challenging one in terms of climate as it was very hot during this time of the year. I assume that it was in the upper 20s-low 30s and humidity was just difficult to bear with. One of the lessons I learned from other tourers abroad is that if delays are encountered, taking a bimodal route, in our case the bus ride from Dumaguete to Kabankalan is fine as some of us didn’t want to risk delaying the trip further. Personally, I felt there was a safety issue in riding late at night in the provinces as accidents are commonplace in the area. This leg has been one of those potential areas I’d like to come back to in the future as the Negros-Panay island has a lot of things to offer in terms of tourist attractions and delicacies unique in the region. Moreover, among the different places in our loop, the food here is great. The ferry trip from Dumaguete to Siquijor is Php 130 and Php50 for the bike. Going back though was different as we took a different carrier and they charged Php140 for the bikes! 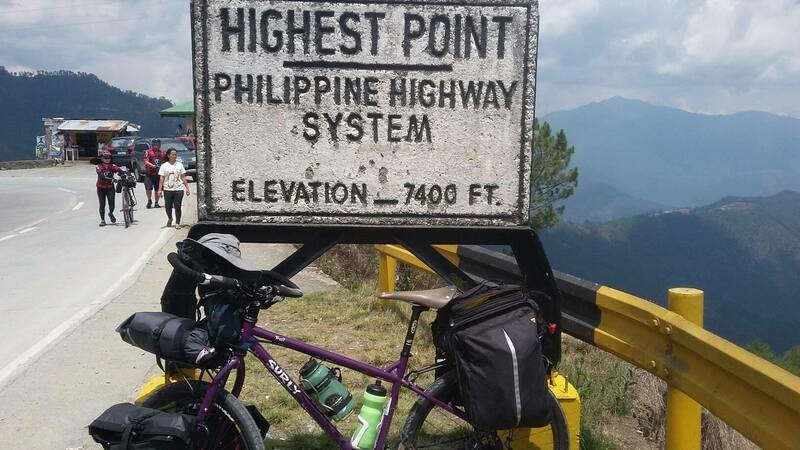 As mentioned earlier posts, it seems that sea travel to biketour the Philippines is one major challenge as costs seem to vary from area to area.